8. Cooling fan built in. 2. Ir ranage: 150m~200m (492ft~656ft). 3. 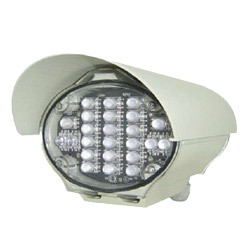 Ir led: 24 pieces. 4. Ir wave length: 850nm. 5. Ir radiation angle: 10 degrees. 6. Ir life time: 20,000 hours. 7. Ir control: automatic photo cell sensor. 8. Ir sensitivity: variable through VR (select a timing to turn on or off). 9. Front and rear cover of housing high impact poly carbonate (unbreakable). 10. Housing and sunshield: aluminium alloy. 11. Power source: dc12v / ac24v / ac90~260v. 12. Power consumption: 2a (max). 13. Ambient: -10 ～ 50℃(14~122℉); 30 ～ 90 ﹪rh. 14. Dimensions: 156(w) x 127(h)x 264(d)mm. 15. Weight: approx. 1.8 kg (4lbs).